When will it be rum’s turn? To climb the price and reputation ladder that is. It’s not like there aren’t a slew of super-premium, high-quality rums in the market – just this June at the Beverage Alcohol Retailer Conference in Minneapolis, two brands (Don Q from Puerto Rico’s Seralles Distilleria, and Ron Abuelo from Panama’s Varela distillery) showed exceptional aged rums. In the former case it was a vintage 10 year old and the Gran Añejo 9 – 12 year old; in the latter, expressions with Oloroso and Port cask finishes. There are numerous super-premium, aged expressions of rum from virtually every producer and brand made. But the rum category has a problem in that its most popular styles – white, spiced and flavored – haven’t seemed to be able to create customers who want to step up in price or quality. 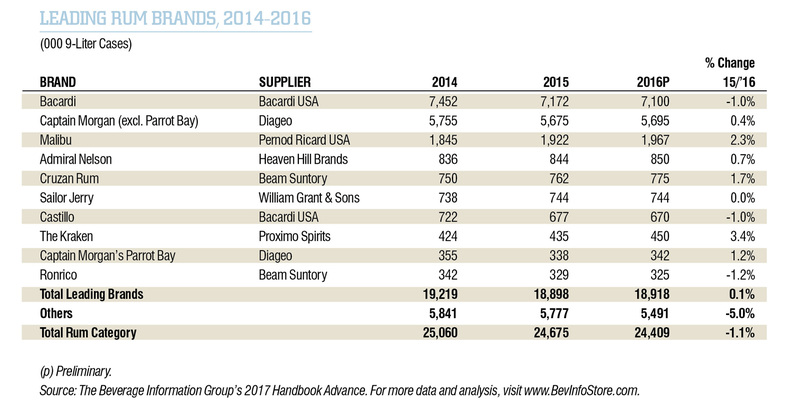 Long dominated by two enormously popular brands (Bacardi and Captain Morgan), the rum category lost ground for the fourth year in a row in 2016, dropping just over one percent to 24.4 million 9-liter cases. Rum has also clearly had a harder time participating with the trend among spirits for premiumization – it now accounts for about 11 percent of all spirits sold in the U.S., but just under ten percent of the value. The absence of many broadly successful higher-end rums has been noted by many, and changing that isn’t going to be easy. The attributes of the still popular but stagnant types of rums – fresh, mixable, flavored, easy to drink – don’t transfer easily to more aged expressions, though of all aged spirits, rum might be the most approachable. “We believe the premiumization of the rum category is just a few years away,” says Ned Duggan, vice president, brand managing director for Bacardi. “Its versatility and diversity in profiles has truly awakened the interest in premium rums and continues to drive the upward trend in the category. And they also realize some serious effort is needed to change things. Moll mentions Appleton Estate Reserve Blend and Rare Blend 12 YO as examples of expressions that can lead the way, both with double digit growth over the past few years. To further segment Appleton’s reputation as a high-end rum, Campari America recently gave two of the brand’s expressions a makeover and a new name: J. Wray Jamaica Rum Gold and Silver are replacing Appleton Jamaica Rum Special and White, respectively. The price and the liquid for both will remain the same as their predecessors. “Rum is a very misunderstood category, and one of the main barriers that the category faces is lack of consumer education. There is a huge opportunity for the industry to create more uniform standards for rum and to better educate consumers. Ultimately this will help the category to premiumize, and become more valued by our customers,” Duggan says. This is especially true for Millennials, who are notably brand disloyal and seen as searchers for the new, the rare and the spirits with stories to tell. Getting them to search the rum category the way they have with whiskey would be key, and with few small, independent American distillers creating new rums, it’s up to the traditional rum producers. It’s not as if the rums aren’t out there or that some producers haven’t been trying, says John Eason, COO/EVP at Serralles USA. Eason believes rum is starting to break out on the premium, with both bartender and consumer interest on the rise. And some brands, like Don Q and Appleton, have been focusing there for some time. Appleton Estate is in the third year of its “Cane to Cocktail” educational program aimed at bartenders through tastings and blending seminars hosted by Appleton Estate’s senior blender David Morrison, with cocktail expertise from a local bartender ambassador. Other rum reps are equally optimistic that rum’s time is nigh. Hodari says the path worked well for other premium spirits – specifically, rum brands can capitalize on the growing trend of high-end rum bars and rum cocktails, and continue working with bartenders interested in the spirit. Plantation Rums set a good example. In addition to creating Pineapple Rum Stiggins’ Fancy, a recreation of a very old style done in conjunction with spirits and cocktail writer David Wondrich, the brand recently launched Plantation O.F.T.D Overproof, a blend of rums from Guyana, Jamaica and Barbados offered at an 69 percent ABV in collaboration with Wondrich and five rum bar owners. Plantation, owned by Maison Ferrand, also recently acquired the West Indies Rum Distillery in Barbados. Whatever the high-end rum, getting the liquid to potential customers (through cocktails, sampling or any other method) that will awaken the idea that rum has a much broader flavor and quality palate than they are aware, is a crucial step, Moll says. The introduction of new iterations with a higher profile may help: in addition to Mt. Gay Eclipse Black, introduced a few years ago, the brand has relaunched Mt. Gay 1703 as an annual selection of 10 to 30 year old rums, with only 12,000 bottles available worldwide. Gosling’s, best known for the very dark Bermudan Black Seal rum, last year launched Gold Seal, a golden-hued variant with a distinct butterscotch quality. Although not flavored, it’s intended as an introductory rum that is different from the current standard of white/spiced/flavored rums. Goslings has also crafted a rare one-off rum marking the America’s Cup races being held in Bermuda, with a blend of rums as old as 50 years, says Malcolm Gosling, Jr, the latest in his family involved in the rum business. Serralles has recently released the second of its new annual Signature Series, Don Q Single Barrel, as well as a spiced variant, and Eason hinted that a new iteration will be offered this fall. And newer brands are emerging: Real McCoy Rums, made by Richard Seale at Foursquare Distillery in Barbados, entered the market with not only a white rum, but also three-, five- and twelve-year-old expressions. Bacardi’s newest rum just hit the shelves – Bacardi Major Lazer Limited Edition Rum, a blend of light and dark rums aged 3-4 years made in concert with the electronic music trio Major Lazer. Bacardi has also boasted the presence of Bacardi 8 at retail, finding consumers to explore the world of more aged and darker rums. “Our primary focus is educating and inspiring consumers about the different ways they can drink Bacardi 8,” Duggan says. Perhaps all that activity – new and innovative products, education, bartender engagement and sampling – will help. Producers continue to be optimistic.